Asian honey bee (AHB) Apis cerana Java was first detected in Cairns, Queensland, in May 2007. An eradication program commenced immediately, funded initially by the Queensland Government. The National Management Group formed to deal with the incursion (originally under the Emergency Animal Disease Response Agreement) agreed to national cost sharing of the program between 1 July 2009 and 31 March 2011. In January 2011, following a re-evaluation of the program, the National Management Group agreed that eradication was no longer technically feasible, but that further action was warranted on a national scale to mitigate the potential impact of this pest bee. As a result, the Australian Government invested $2 million from July 2011 to June 2013 in an Asian Honey Bee Transition to Management Program, managed by Plant Health Australia. The program was bolstered by contributions from partners, with funding contributed by Biosecurity Queensland and the Australian Honey Bee Industry Council and the Federal Council of Australian Apiarists’ Association. The program involved a range of project specific action plans, conducted by Biosecurity Queensland. The activities engaged individuals, communities, local government, agriculture and environment agencies, production and service industries in developing knowledge, tools, strategies and actions to mitigate the social, environmental and economic impacts of the pest. 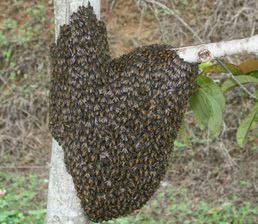 Funding provided to the program by Australian Honey Bee Industry Council was used to fund and facilitate research on developing management strategies and suppression techniques of AHB to assist the honey bee industry to manage the impacts. identification of critical intervention points and processes to reduce the long distance spread of AHB through transport facilities and other risk pathways. In 2011–12 PHA established the AHB Transition Management Group to oversee the implementation of the program as well as establishing an AHB Scientific Advisory Group of honey bee scientists and industry experts (see below) to provide technical advice on specific scientific matters. The plan for the Transition to Management for Asian Honey bee and the project reports generated by the program are listed below. The Asian Honey Bee Transition Management Group (AHB TMG) consisted of senior representatives of the Australia Department of Agriculture, Fisheries and Forestry (now DAWR), Queensland DAFF (now QDAF) and the Australian Honey Bee Industry Council (AHBIC). The AHB TMG oversaw the establishment of the program, monitored its delivery and considered any triggers arising that necessitated a review of the program. It was chaired by the Australian Government Department of Agriculture and Water Resources. The Asian Honey Bee Scientific Advisory Group (AHB SAG) provided advice on technical and scientific matters to the AHB TMG on request.